Symbol - Wall mounting bracket for MC9000/MC9050/MC9090/MC9097/MC9190. Order one for Single Slot cradle and one for the SAC9000. Order 2 for 4 Slot Cradles. 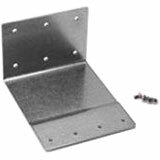 Order Cradle Bracket separately to attach to the wall mount bracket. The Symbol KT-61498-01R is also known as Symbol Technologies	SYM-KT6149801R	or KT6149801R	.